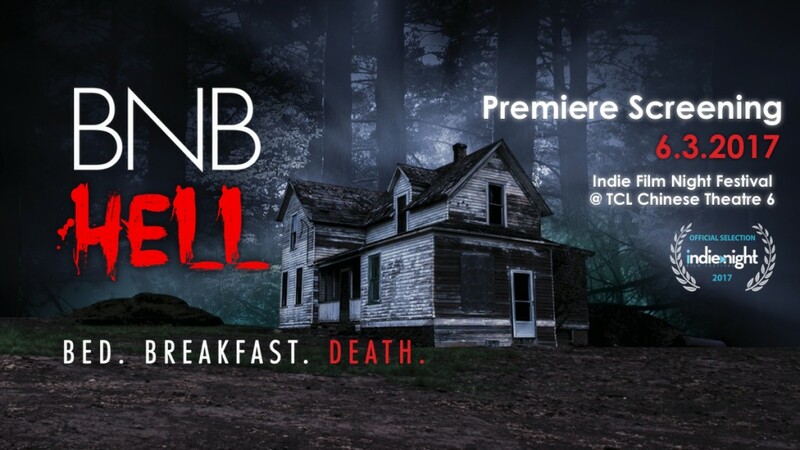 BnB Hell marks director Andrew Jordan’s first feature length picture, and that inexperience shows. A handful of beats go neglected entirely, the sound is often uneven and it feels as though Jordan is incapable of drawing the best from a few key players. That includes – unfortunately – female lead, Kimberly Woods who’s stiff far more than relaxed. But, beyond those problems there are actually some good things happening here. The story follows Willa as she retraces the steps left behind by her now missing sister. Her makeshift investigation leads her to a strange Bed & Breakfast joint where the owners aren’t quite right and the feeling of comfort is exterminated immediately. Willa learns fairly quickly – especially after meeting fellow traveler Marco, who isn’t entirely comfy himself – that her sister most likely never escaped this chilling establishment. But what can she do? Is it possible to avenge her sister? Is it even possible to escape? The camera work is all adequate but basic. There are no fancy shots and no jaw-dropping cinematography or editing to admire. Technically speaking, it’s a pretty bare bones affair. But what I did enjoy about the pic, is that everyone tries. No one phones in their performance. Even those who simply lack the polish to impress consistently give it their all. I can get behind that. I can also get behind Marco, or Rudy Dobrev. He’s the show stealer of the production. He seems to understand the energy required for each specific sequence, and he’s diverse enough to properly project a wide variety of emotional responses. In short, he looks like he’s about 10 years ahead of his cast-mates. I’m looking forward to seeing more of this guy. He’s the saving grace here. The film concludes on a very predictable note. You’ll likely see the “twist” coming shortly after the introductory scenes of the film. That happens. It isn’t easy nailing mystery without so much as a misstep. I can handle the shaky moments of BnB Hell because the spirited moments are worthy of looking into. BnB Hell may not be the glossiest production, and it may not be the most original of films, but it’s worth a once over, no doubt. If nor no other reason than to say you remember Rudy Dobrev back when he was just shooting tiny little horror films… because this kid’s future is bright, and he’s not likely to be limited to micro films for long.